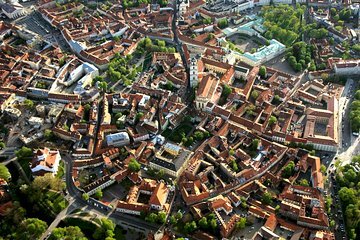 Desfrute de vistas panorâmicas sobre o centro histórico de Vilnius neste voo de balão de ar quente de 1 hora. Após uma picape no hotel, entre na cesta com um piloto e suba aos céus! À medida que sobe mais e mais alto, desfrute de vistas panorâmicas sobre Vilnius para a paisagem circundante e aproveite esta experiência relaxante ao máximo. Quando seu voo de balão de ar quente chegar ao fim, pouse suavemente em um prado e beba champanhe enquanto a equipe arruma o balão. Então, volte em conforto para o seu hotel em Vilnius. I felt happy in the sky. It was very good experience with beautiful sunset. Staffs were so kind and skilled. I will recommand this hot air balloon tour to all visitors of Vilnius. This was amazing! Worth every penny! In a word - superb. The whole thing from being involved in getting our balloon ready for take-off, through to helping to put it away after landing. The scenery was stunning and our guide excellent. Of course we had beautiful weather which always helps. But I can't recommend this trp strongly enough and would definitely do it again. Balloon flight over Vilnius was a great and beatiful experience! We appreciated the professional crew and the way we were treated from pick-up at the hotel and until we was back at the hotel. Highly recommended! due to an impending storm we were unable to make the flight over Vilnuis but had a lovely flight over the nearby lakes and castle at Trakai. Fantastic ride over the Old Town with Arturuz - the pilot and Lukas - the driver, both great guys. We were collected at 6:10am for our morning balloon flight. We were drive to the take off site where the balloon had to be inflated, some of the passengers helped with this by holding the balloon. We were shown how to climb into the basket safely and then we lifted off or should I say up! The views were magnificent and the weather perfect for a smooth, calm ride. It can be very hot in the balloon as the burner is switched on periodically to adjust height etc. Once landed after the balloon is packed away we had a traditional ceremony for 1st time passengers. We were driven back to our hotel and arrived at 9:40am. I would definitely recommend a balloon flight in Vilnius and with this Company!